Virtual New Zealand Stamps: 2018 Back From The Brink. 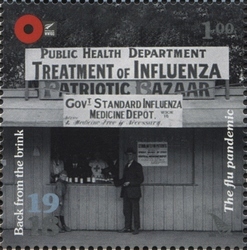 - 1918. 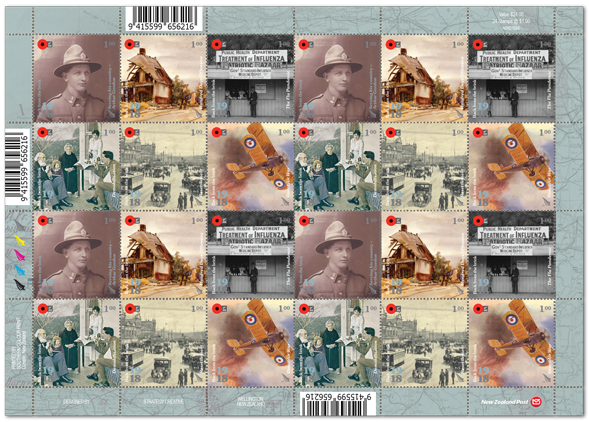 2018 World War I Commemoration Book Series. Back to 2017 The Darkest Hour - 1917. The beginning of hope. In this, the final instalment of this World War I series we see the end of the war and things beginning the long road back towards normal although they would never be the same as they were before the war. During World War I, things had changed, the world had changed. 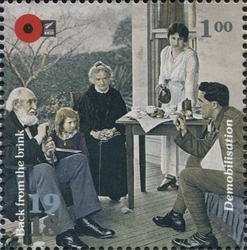 Back in New Zealand, families were coming to terms with the knowledge many young men would never return. Many women, who had enjoyed new freedom outside the home, working in employment, job situations never opened to them before the war didn't want to return to being a house-wife. 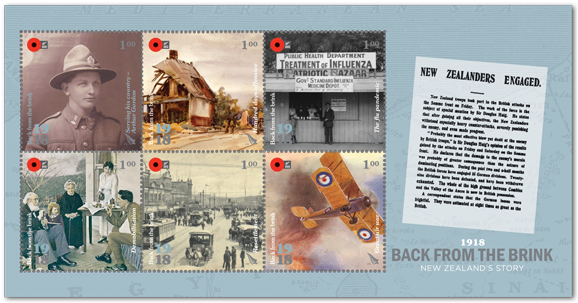 All ten stamps on a special miniature sheet. More caption information will be added later as it becomes available. 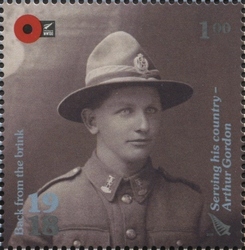 $1.00 - Arthur Gordon. $1.00 - Hundred days offensive. $1.00 - Demobilisation. $1.00 - Resettlement. $1.00 - Great air war. 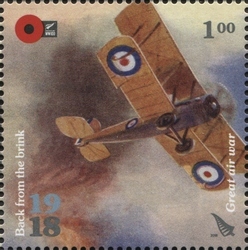 10 Stamps sheet and First-Day Cover. 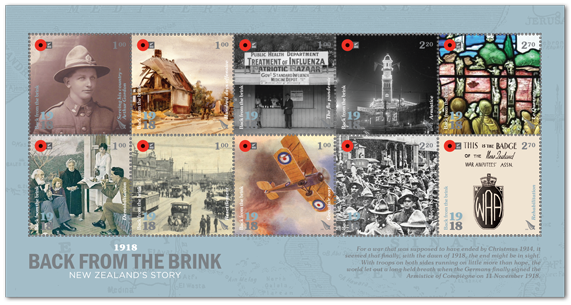 This sheetlet includes all ten stamps from 2017, Back from the Brink - 1917 stamp issue. 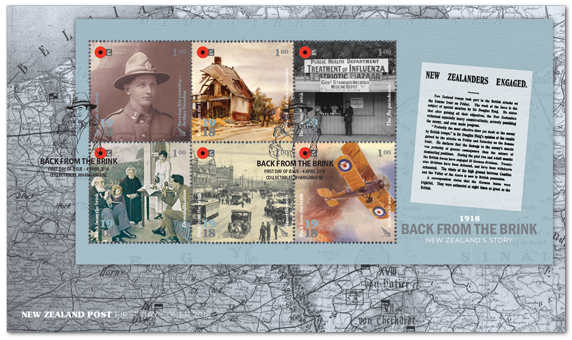 The various stamps give an insight into New Zealand's involvement in the war during 1918. 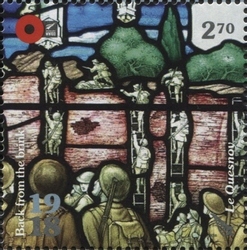 The 10 stamps also appeared on a collectable first-day cover, which features a photo of Kiwi soldiers seen on parade in the French town of Le Quesnoy after they took it back from the Germans. 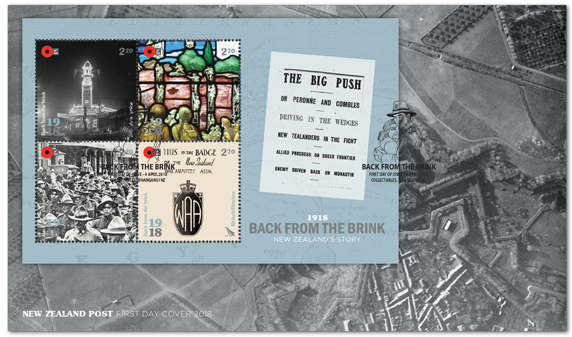 This issue included two miniature sheets complete with their own FDCs. 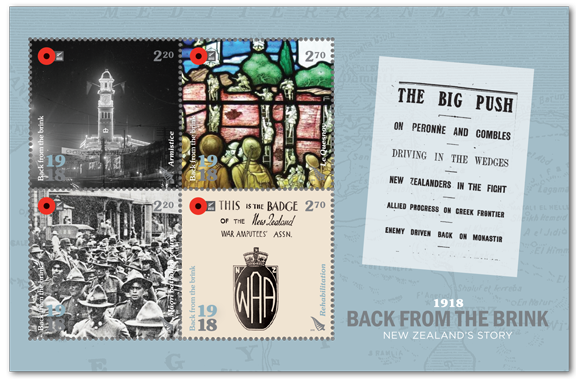 Each miniature sheet shows a news article or headline from 1918 recounting to the masses at home the success of Kiwi troops. 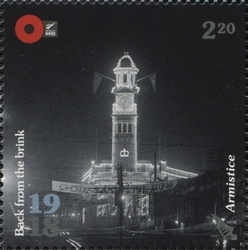 While this news wasn't always complete, towards the end of the war, the incoming communications were increasingly positive. 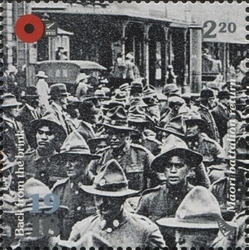 The six lower value $1.00 stamps appeared together on this miniature sheet. To the right can be seen a newspaper article as mentioned above. Immediately below is this sheet on a First-Day Cover. 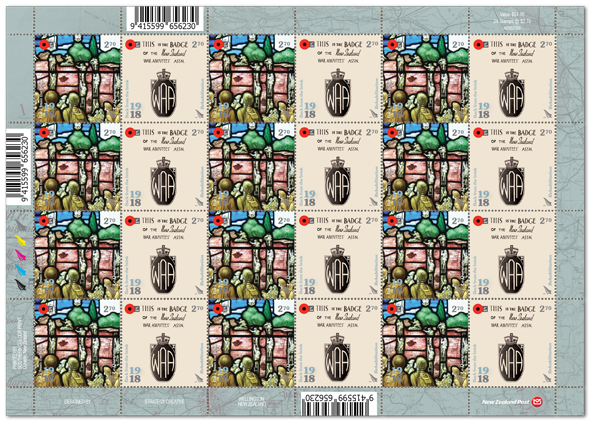 The four higher vales, 2 x $2.20 and 2 x $2.70, can be found on the second miniature sheet seen above. It's FDC can be seen below. This issue came as a set of three full sheets. 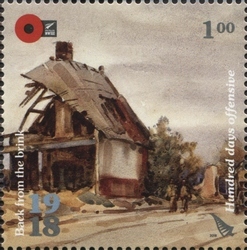 Date of issue: 4 April 2018. 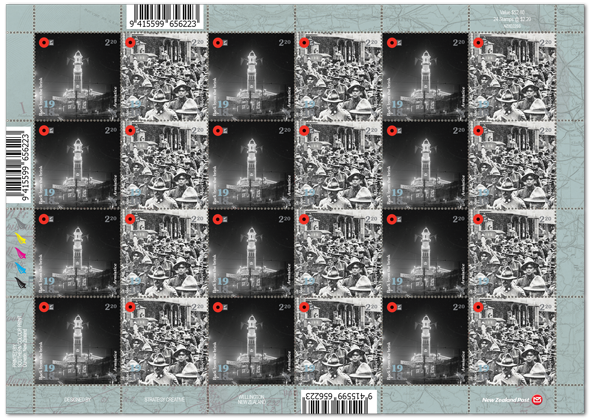 Number of stamps: 6 x $1.00, 2 x $2.20, 2 x $2.70. 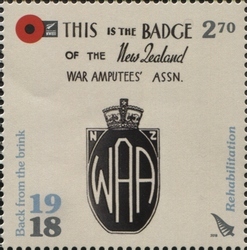 Stamps designed by: Strategy Creative, Wellington, New Zealand. 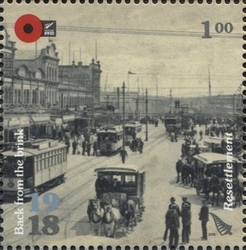 Period of sale: The stamps remained on sale until 5 April 2018. 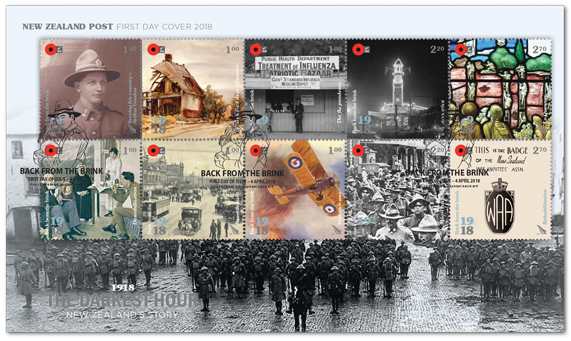 First Day covers remained on sale until 4 June 2018.